These statements come from recipients of the Ontario Basic Income Pilot, a program to guarantee a minimum annual income of $16,989 Canadian — about $13,000 USD — to certain residents of Ontario, Canada. The aim of the pilot program, which was launched in late 2017, was to understand how people’s lives might change if they knew with certainty that they would have enough money to cover basic needs. The plan was to provide a guaranteed basic income to 4,000 people over the course of three years and then analyze what impact it had on recipients and their families. That is, until the new government of Ontario decided to abruptly cancel the program. The recently-elected Progressive Conservative government of Ontario announced in July that they intend to end the pilot program early, before any data could be collected. This decision reneged on an explicit promise made by the party during the campaign to continue the pilot program through completion. While it’s unfortunate that cancelling the pilot program means a lost chance to better document and measure what impact a basic income has on people’s lives, what’s far worse is the impact this will have on those currently receiving support through the program. Basic income recipients have been going back to school, starting businesses, and generally making plans for their future, all based on the belief that they would continue to receive their basic income for the full three-year pilot duration. By suddenly ripping support away, many people will end up far worse off than they started. But people are not taking this news lying down. Across Ontario and all of Canada, people have risen up to protest the cancellation plans. Rallies are being organized, articles are being written, and people are sharing their stories of what a tremendous impact basic income has had on their lives. This response makes one thing abundantly clear: basic income is a policy of the people. If you read most coverage of universal basic income in the United States, it would be understandable if you came away with the impression that this is an idea that’s only supported by Silicon Valley tech moguls who fear a coming wave of automation will massively displace workers, and the only solution is to give everyone some cash every month to ensure they don’t starve. But overshadowed by that sensationalized narrative are the many, many people, both in Canada and the US, who believe that a universal basic income would recognize and support fundamental human dignity and deservedness in a way that is sorely lacking in our current social safety net. The response from Ontario gives us a rare glimpse into how much grassroots passion is actually behind basic income. 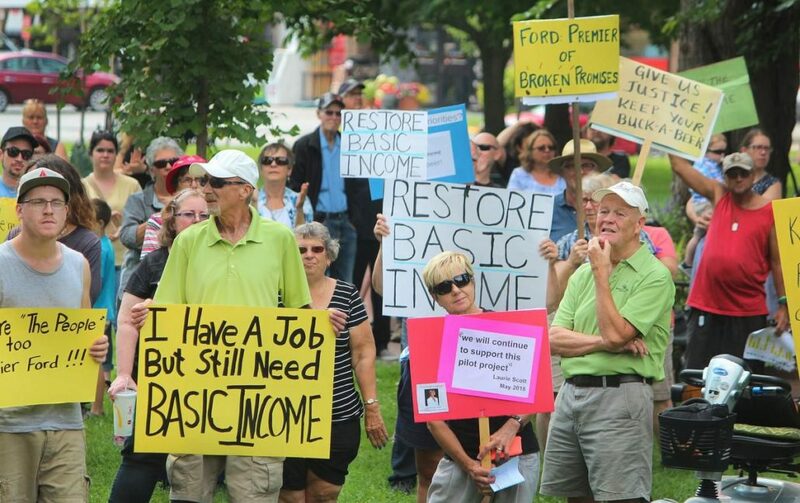 Over 29,000 people have demanded that the Ontario government reverse their cancellation plans, and more and more basic income recipients are coming forward to share what a difference basic income has made in their lives. A lawsuit has been brought against the Ontario government over the cancellation plans, and efforts are being made to encourage the federal Canadian government to continue the pilot if the Ontario government will not. It’s unclear at this point what will happen with the Ontario Basic Income Pilot. But regardless of the outcome, what is clear is that this is a policy that people want. The real question is if and when our elected officials will decide to listen. This article has been updated from an original publication on Medium.